This dish is easy to make and you can easily find all the ingredients in your cupboard. As I love my lentils all mushy, I will soak the lentils for about 2-3 hours later before cooking. I served the lentils with some plain basmati rice, but I think it would go much better with some plain naan bread. 1. Dissolve the creamed coconut in a jug with 1 pint of boiling water. 2. Toss the whole spices in a frying pan over medium heat for 2-3 minutes, or until they start to jump. Tip them into a mortar and crush. 3. Heat the oil in the pan over high heat, and brown the onions until they are dark at the edges. Lower the heat to medium and add chilli, ginger, garlic, turmeric, fenugreek, and the finely crushed roasted spices. Stir everything together. 4. Stir in the drained lentils and add the coconut liquid. Bring to the boil, put the lid on, and lower the heat to simmer for about an hour. Stir occasionally. Season with salt and pepper shortly before removing the pan from heat. 5. 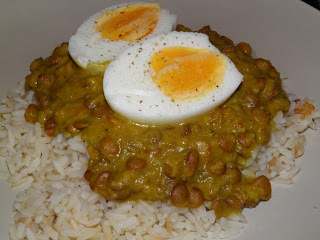 Spoon the lentils over some plain rice, and lay the halved eggs on top of the curry.